This is the index of the first free multi-lingual web magazine for Linux sorted by subject. What famous people think about Linux and related issues. What's going on in the community. Game software for Linux, jokes and funny things. Useful applications to work with. Manage your system or network. Linux is a great development lab. Software Development related to web-design. Find out about all these tools to become an artist. Good thinks to knows to get the best out of your free system. 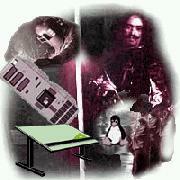 The nuts and bolts of Linux. People involved with Linux tell us what they do.